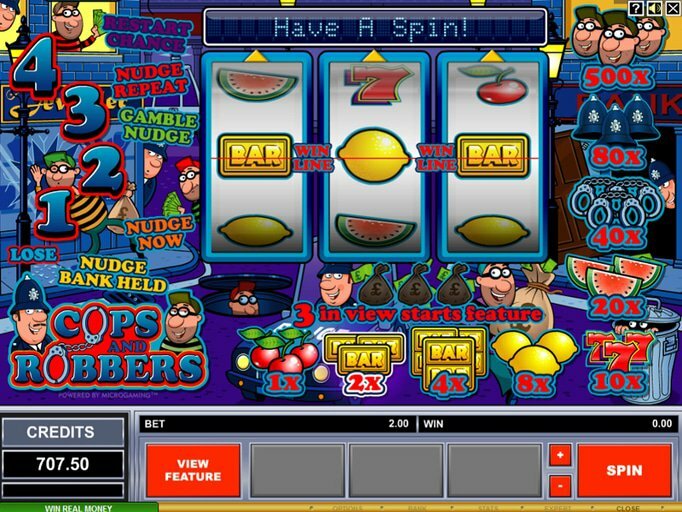 While many video slots tend to repeat the same features over and over again with different themes, the Cops and Robbers slot machine from Microgaming offers up a few things that are hard to find anywhere else. This is a three-reel, single payline game with a potential jackpot of up to $500 coins, and while that might seem small, it is quite impressive for a penny slots option. The first thing that you'll want to do is decide how much money you'd like to spend per spin. There are a few different ways to customize this considering that the minimum bet is $0.01 and the maximum is $10. There are several coin denominations ranging from $0.01 to $1 and you can wager anywhere from one to five coins on the single payline. However, the most exciting thing about Cops and Robbers is that there are many different types of bonus rounds available; this is next to impossible to find with any other three-reel classic title out there! This all starts with the Chaser Trail bonus game that requires you to travel 36 spaces as you spin the reels. Nudges and holds are an integral part of this title because you can accumulate up to 50 as you play, allowing you to coax the reels into any position you'd like to create a win! This is a far cry better than traditional wilds and scatters since it provides you with the opportunity to actually control what happens. There are some other features as well, including the ability to win between two and 20 free spins, participate in the 'Inside Job' round in which a random win is guaranteed, and choose the Swag or No Swag gamble round during which you could win a random bonus based upon the choices you make. Gaming Club Casino is the perfect place to enjoy the Cops and Robbers slot machine since you can take advantage of a 100% deposit match of up to $350 - a deal that is sure to fit almost any budget! Of course, as an added bonus, you can also receive 30 free spins that can be used on the Mad Hatter slot they provide. You'll get to keep all of your winnings, but wagering requirements and withdrawal regulations will apply.